Entries tagged with “Cornelius Cardew”. I’m sure it comes as no surprise to the readers of these pages to hear that there has been little music this year, especially improvised music, that has really captured my interest. Certainly there has been well received releases and all of that but with only a couple of exceptions I’ve found little of it to be of sustaining interest. This is why for these monthly music entries I’ve been primarily focusing on releases of mostly composed music which has been engaging my interest. While I’m still listening to plenty of music from my collection I don’t think I bought a single piece of music this month and since I don’t really want to delve into stuff from the collection for these posts, I thought I’d do something different this month: analyze a recording of a couple of pages from Cornelius Cardew’s Treatise that I recorded myself but have not made available in any form. In the autumn of 2005 I went to New York City for the ErstQuake 2 festival where Keith Rowe performed in several sets. Over the course of the festival I was able to meet and talk with Keith a bit in which I learned that he’d be playing a couple of shows in Seattle. One of his two dates in Seattle he played from Treatise and I ended up talking to him quite a bit about this as at the time as I was actively engaged in performing it with the Seattle Improv Meeting. While I had at that point researched Treatise extensively this first discussion with Keith was the beginning of a much deeper relationship with the score. Keith showed me his personal copy of the score and I noted how extensively marked up each page was with direct indications of the gestures performed for specific symbols and even an overall time range for some (perhaps all?) pages. This of course is a fundamental aspect of really treating the material as a score and not just as a springboard for improvisation. I took these ideas back to the Seattle Improv Meeting and had us work on a single page from the score for several months in a row. The idea was to build up a body of gestures to map to the symbols consistently. Over the weeks we’d refine our approaches and ideally, at least within the subset of the symbols on the page we were working on, develop our own personal but consistent language for the score. This worked out well and from that point on I would use this language as I played from the score, sometimes iterating on it, sometimes refining it and sometimes abandoning specific gestures as I altered my approach. I should of course note that we had more or less been developing our own language all along as we’d been working on Treatise all that year winnowing down the body of gestures we had experimented with, but this exercise I think was fundamental in our approach and understanding of the score. You can check out our results of working on page 72 on the meeting recording archive. Several years later, I found that notated page and decided to record a solo version of it plus the following page. 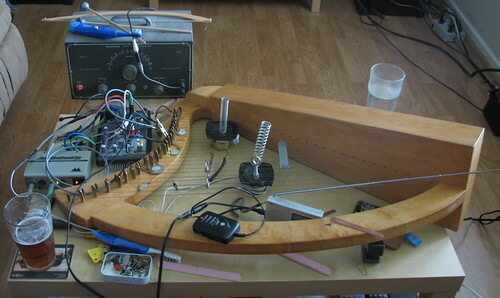 I’d been developing my prepared wire strung harp into a very particular setup combined with electronics and this seemed an ideal way to fully explore this setup. So late winter 2007 I set my harp upon the table and recorded these pages resulting in this recording. The downside of recording oneself is that one is playing as well as engineering and one can really only focus on one of these. Thus in this recording the levels were too high initially which I eventually noticed and turned down. This has led to the first part of the score seeming much more dramatic then the rest of the score as if its symbology in some way demands this, but of course on looking at the score you see this isn’t the case. For this reason I’ve always felt this recording was somewhat compromised and post processing on this was never able to satisfactorily resolve this (because it is I think clipping initially and that is obvious even if the volume is brought more in parity with the rest of the recording). So I just filed this one away for years now but in many ways it is the best document of a portion of my musical life that isn’t documented anywhere else. So I present this now for the first time as a vehicle for examining an approach to the score. Use the player above to listen along as you read, or you can download one of several archives (recommended) that contain the recording plus PDFs of the Treatise pages including my annotated page: Apple Lossless, FLAC, 320kbps mp3. The first symbol, apart from the center line, on this page is the number 3. The numbers in Treatise are about the only concrete symbols, that is to say they aren’t an abstraction upon which an interpretation can be placed but actually have a meaning in and of themselves. 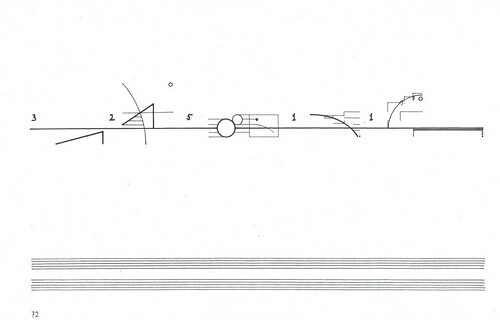 Of course as Cardew offers no direct explanation of how to interpret any aspect of the score, much less the numbers, one could just treat them as just another symbol with which one is working with. 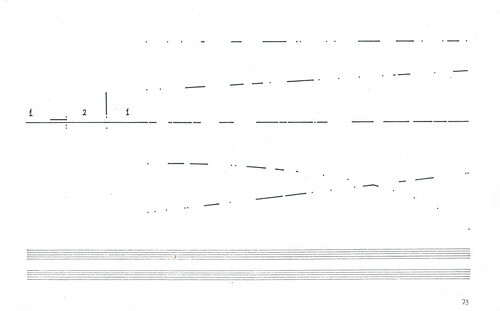 However it is part of the oral record of performance of Treatise, which I first heard from Keith, but later also from John Tilbury both in person and in his essential Cardew biography, that the numbers are treated as outside of the system, that they are interpreted as the number of repetitions for an event. Since learning this I’ve always treated them this way and in this recording it is no different. As you can see in above scan there is an notated event associated with each number; part of the assignment from the SIM was to notate what we’d done after we played from the page. So from the session where these notes where taken I applied “3 Sets of Bowed strings” a here set meaning a full bow stroke. In this recording I instead strike a spring that is mounted on strings above a contact mic. This is repeated three times each time waiting for the spring to settle before striking it again. The next symbol is an upwardly inclined line of moderate thickness which ends with a short vertical line, creating two sides of an scalene triangle. For this symbol I note “descend by 1/3rd” which I do, by playing down a series of strings with a bolt, repeating it a third lower for the gamut of the harp. For the sharp vertical drop I “ascend by 1/5” which is the same gesture only moving up by fifths for each repetition. The next number, a 2, follows a short gap to which I respond with a pair forceps which are clipped to the strings in such a fashion that it can be lifted up, dropped on the strings whereupon it oscillates for a time. This is of course repeated twice. The resonance of the harp, from sympathetic vibrations as well as the long sustain of the wire strings can be heard well beyond the last of the forceps oscillations. In the original notes I again bow the strings, specifying that I use high strings. A pure tone comes in at this point, in response to the thin curving line that comes in from above. I always use pure tone for curved lines, either from an eBow on the strings or live or sampled electronics. In this case it is the oscillator that you can see in the setup picture above, but it has been recorded and is being played off an iPod. I had created a sample library from that oscillator as I loved it’s sound but it is rather unwieldy to lug around. However unlike the oscillator you can hear the sample repeat, which I consider somewhat unfortunate. Momentarily after the tone comes in you can hear the excitation of multiple strings with a rather circular sound. That is in response to the thin parallel lines, which my standard gesture is to rub multiple strings with a stone. This is indicated by the “Rub Strings” note, to which, by this time, I would be fully prepared to apply the rock to the multiple strings – one of the earliest and most consistent gestures I developed. Along with the stone I am also observing the “descend by 1/4” instruction for the sharper angled heavy lined triangle, which is again done via a bolt. The abrupt dropout is again similar, but its greater length modifies the gesture to “ascend by octaves“. For the last few seconds the one thin horizontal line is the only thing you hear in this cluster now, the stone rubbing on a single string. Just about the end of the line is a circle above it, for circles I always use a percussive event here it sounds like I tap the body of the harp with an object. There is a gap between that last cluster and the next event: the number 5. Five repeated events, in this case it is bringing up the volume on a radio that I have in a feedback loop. It is tuned to static and bringing its volume up in this way creates that abrupt whispery sound, with that hollow almost echo-y sound that feedback adds. Another short gap and then another cluster of sounds. Again there are several parallel horizontal lines which I address via the stones on several strings. I chose to excite the strings around the spring/contact mic resulting in an over-driven metallic assault. The surrounding spring represents the surrounded larger circle with its percussive attack on the contact mic. Around 8’25” you can hear a percussive event necessitated by the smaller circle: the forceps vibrating against strings. But what of the square? In the notes, I indicate “gliss strings” (I think) but I had long since settled on using the square as a symbol to listen, based on a comment that Tilbury made in the Treatise workshop I took with him; that the symbols do not have to correspond solely to musical gestures. When playing a score the important thing is to respond to the symbols regardless of what the ensemble is doing; they may be playing whisper quiet but if the score says to play loud, that’s what you do. I treat Treatise the same way, but I use the square when it comes up as a direction from the score itself to listen to the surroundings and to bring them into the proceedings. Since I was playing this alone in my living room, I think you can hear this in the change in tone toward the end of this cluster, as the single line curves downward. The percussive event at 9’48”, muted strike on the strings by a mallet, is probably slightly off-time and should have been in response to the black circle just before the line begins to curve. After about thirty seconds of silence the number 1 is responded to with an electronic tone turned on and off. Another pause and then a pure tone, louder then the earlier one, for the thicker downward curving line. At 13’05” I begin to softly rub the strings as the horizontal lines require. The thinness, shortness and stagger nature demand the softer approach. The vertical segments are handled by brushing against the spring and contact mic at times. A very short pause and then a strike on a piece of metal lodged under the strings for the percussive dot right at the end of this cluster. Another 1 this one handled with a single pluck on one of the lower strings. A pure tone for the ascending curved line, this one lower and richer, most likely from an eBow on the strings, though again a sample of this as opposed to a live eBowing. The stone comes in and out for the horizontal strings and you can hear a rather squeaky bowing now and again for the vertical lines. The radio is brought in at 7’44” with gentle static for the thick line paralleling the center line and the tone shortly thereafter stops a bit after the percussive event at 8’08” for the circle (the pure tone actually goes on a bit too long after that, most). The soft radio static plays out to the end with a sharp, by soft percussive attack for the final three dots at 20’19”. That concludes the first page and this in-depth study, though I describe the second page in brief below. What is interesting to consider here is the difference between the notated score above and what I actually played. Now I made at least two notated scores during the SIM project and I suspect that the above score was the first one of these. It has the hallmarks of notating what I did in a session before refinement and abandonment of rather unsuccessful gestures. Many of the techniques notated here are ones I have not kept in my repertoire and just rereading them know they aren’t things I’d regularly use especially as a constant response to a symbol in Treatise. The gestures that you use in this have to be consider, have to be adaptable, have to be amenable to the interpenetration that so often occurs amongst the symbols in the score. It is instructive to see this work in progress as I was learning both the instrument and the score. The pitfalls of poorly considered gestures was only just beginning to make itself understood. Playing the same page over and over again taught some of these lessons, but playing more of the score really brings them home. When you play the same symbols for page after page, the all their permutations, variations and interpenetration, you learn the weight of each single sound. A bit over twenty minutes into the recording I leave page 72 and proceed onto page 73. As I’ve described above at the time of this recording I was several years past the page 72 exercise I did with the SIM and had quite extensively developed my personal language with it. When I’d play pages that I hadn’t played before, hadn’t explicitly worked out what I’d do for every symbol on the page I was still able to play it with a high degree of consistency and rigor. While still working with the same set of tools it would be a bit different when I’d “sight read” these pages: perhaps I’d not respond to every symbol(which is always an option and in fact preferable in many cases), perhaps some nuances w/r/t the variation in some symbols wouldn’t be as developed. In the case of continuing from page 72 to page 73 it was rather straightforward and I quite like how it developed. The symbology of page 73 directly continues on from page 72 with its lines and dots at first exactly how it was used in the previous page but then becoming scattered and more fragmentary. The center line also loses fidelity; always an important event to take notice of. My response to this page was to continue playing it as I had page 72 but to reflect its fragmented nature, to work with the gaps, the variations alter the techniques used for these symbols to try to capture this essence. While I never was satisfied enough with this recording, this is probably my single favorite performance of Treatise that I’ve done, certainly as a solo. The rawness of it, its mix of the prepared wire strung harp and primitive electronics, the layering of disparate elements, all of these I think worked really well and I find completely engaging. It reminds me a bit of David Tudor’s epic performance of John Cage’s Variations II in its use of over-driven amplified acoustic sounds. While not in that league of course to me it is in the same general area which I find all the more striking as I really hadn’t listened to that piece until a month after this recording was made. Additionally there are a lot of my concerns with sound addressed here, things that I think a lot of people don’t necessarily like, don’t find beautiful: flatness, hums, lack of warmth – these are things that I’ve engaged with for years and are well applied here. I like how the more dramatic feel of page 72 persists into page 73 but as the lines fragment and become more scatter so to does the music. • A Young persons Guide to Treatise – my Treatise resource page. • Cornelius Cardew – A Life Unfinished by John Tilbury, Copula, 2008. • My report on a Treatise workshop with John Tilbury. • Seattle Improv Meeting recording archive containing many recordings of Treatise. • Keith Rowe’s solo Treatise performance in Seattle. • On performing Treatise. My analysis of several recordings of Treatise. In the spring of this year there was a Cardew retrospectiv-ish looking thing in France put on by the Centre d’art contemporain de Brétigny that included John Tilbury, Keith Rowe, Marcus Shmickler, Rhys Chatham and many people I’m unaware of. I’d read about this back when it was going to be put on and apart from a regret that I couldn’t attend it more or less slipped my mind. In doing some searches for the Tiger’s Mind (I was curious if anybody had made a recording of the performance that Keith Rowe put on at Mills College as the David Tudor Composer-in-Residence ) I discovered that that the CAC Brétigny had setup a website for the festival and put up mp3s of the entire thing. These are all streamable from the website site but you can also get into their FTP and download them all directly from this directory. This was a pretty impressive event and I have to say that it is great that they have put it all online. So far I’ve only listened to the Keith Rowe Treatise, which is quite nice, the Tilbury Piano Music, which is excellent and the Tiger’s Mind, which was interesting but not to my taste, nor did I really get much of a sense of the score from it. I look forward to working my way through the rest of the material. In June 1969 the draft constitution for the Scratch Orchestra was published in The Musical Times. A month later the first meeting of the orchestra took place. The concept for the orchestra was Cornelius Cardew’s and it arose as an extension of the improvisatory work that he’d been doing in AMM. He had for some time been teaching an experimental music class at Morley College for which he’d written The Great Learning. Needing a larger amount of people for this piece’s choirs of trained and untrained musicians he, along with Howard Skempton and Michael Parsons, put together the draft constitution and put out an open call for members. In celebration of the forty year anniversary of the Scratch Orchestra, Carole Finer put together an entire weekend, thirty-six hours worth of interviews and music. The last major Scratch event was fifteen years ago for the twenty-fifth anniversary (pdf of the 25 Years from Scratch programme) which involved a whole day long concert but like so much of the Scratch was London centric. The impact of the Scratch extends far beyond the UK and this radio program, available worldwide on the Resonance internet stream brought this celebration to all. 36 hours of material is really too much to remember much less go over, so I’m just going to summarize each segment with extended details on some of the really striking material. If the post gets too long I’ll probably break it up into a couple of parts. Basically you can summarize this program in three major categories: music, reminiscences, and legacy. There currently is only about two hours of recorded material available from the Scratch which makes the vast amount of musical material broadcast in this program the most valuable aspect in my opinion. The individual experiences and anecdotes of the members is fascinating, though with the publication of John Tilbury’s exhaustive Cardew biography many of the best of the anecdotes are familiar. Getting these direct from the sources without any editing or filtering certainly adds a lot though in both content and perspective. Finally the aspects of the program that dealt with the the impact of the Scratch on the world beyond itself for musicians and beyond are fascinating. Whether it is the current activities of the original members, members of the British musical community that were influenced by the Scratch or new students just beginning to learn about them the legacy of the Scratch is vast and underrated. The program began Saturday 4am Seattle time and ran to 6 pm Sunday. I listened from 4am to midnight, slept for 8 hours or so and returned to it before 9am Sunday listening until its conclusion. I recorded the entire stream using the excellent Audio Hijack program and have since the initial broadcast listened to the 8 hours I missed and re-listened to many of the various chunks. Overall I found the whole thing very charming, the members would be talking to each other and cutting off anecdotes as everyone knew about that, as if they weren’t on radio at all. The music displayed the whole range of the orchestra from inspired cacophony to clumsy political anthems. Their setup, being that most of them were inexperienced radio presenters was quite well done; they had a collection of files that they referred to as the Scratch Jukebox that they would dip into when they finished interviews early, needed to set up for live performance and any sort of potential “dead air” situation. Of course this lead to a number of tracks being played a multiple times and many (too many) of them weren’t ID-ed. So scatted among 36 hours of recordings is tons of music, of varying interest and mystery. Without listening again to every hour I can’t talk about all of them but I would like to try to catalog them at some point, perhaps in a latter post. The program began with Carole Finer, giving a brief introduction to the Scratch, how the 36 hours was going to run and then played an excerpt of the first Scratch Concert, from Hamstead Town Hall the summer of 1969. This portion at least of the concert had an a similar feel as parts of The Crypt with an almost undifferentiated background roar overlaid with barking, blasts from various brass instruments and innumerable percussive sounds. Pretty interesting in a way, lacking the focus of AMM but capturing a pretty overwhelming though fascinating soundworld. There is more chatting and piano from Hugh and then Frank Abbot, who discovered the Scratch thanks to a friend into avant Jazz. After seeing them perform he joined the group. They played an 8 min piece of his that he spliced together from cell phone recordings he made with the visual artist Duncan Higgen. The segment concludes with Carole playing the banjo: two pieces by Howard Skempton Banjo Piece for Carole from 1970 and another short one from 1972. and a recorded piece by Micheal Parson for Carole’s 70th Birthday (from a recording) and a reading from Tilbury’s Cardew bio. He begins by asking Keith what he’d been doing when the Scratch was formed which was of course AMM which Keith described as the most important musical thing he’s done in his life. 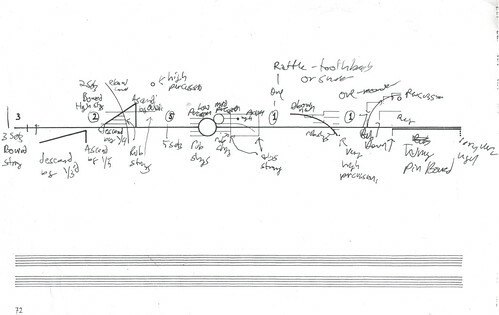 He described Scratch as an extension of the way that Cardew was dealing with notation. The orchestra as notation. Did the Scratch Orchestra impact AMM Ed inquired: ” Not really.” Cor was kind of moving on from AMM having “figured” them out and needed more challenges. Keith felt his role in the Scratch was as an orchestral member, he never wrote any pieces for it. They return to the music with Ed asking was was the best aspect of the SO for Keith to which he replied, the all-over nature of the Scratch ala abstract expressionism. The interview concludes with some discussion of Keith’s current activities which have been playing in the pit for the Merce Cunningham Dance Company with Christian Wolff and Takahashi Kosugi. These sound as interesting as ever for the Merce Cunningham dance company – wish I could have seen some of these. This segment with Scratch Orchestra co-founder Michael Parsons begins with a section from the Scratch’s Pilgrimage to Scattered Points of the Body to the Brain, Inner Ear, Heart and Stomach from Queen Elizabeth Hall 1970. This piece was a typical Scratch concert in that it involved a lot of disparate material being played simultaneously. A number of sections from this concert was played throughout the 36 hours and it seems to be one of the better recorded concerts they have. A CD (or even better a DVD with some of the filmed material as well) release of this would be I think a valuable addition to the Scratch Body of work. After the above chunk of Scratch music Parsons then has a discussion with Seymour Wright, Sebastian Lexar and John Lely, emphasizing the legacy of Scratch on later generations of British improvisers. John Lely is a British composer who studied with John Tilbury and Micheal Parsons and has played with Scratch stalwart John White. Lely first encountered the Scratch in Micheal Nyman’s Experimental Music: Cage and Beyond and he said it was the Scratch scores in the book that immediately appealed to him. The accessibility and informality of the musical approach, that anyone could do it with any objects. Wright and Lexar are both members of Eddie Prévost’s long running improvisation workshops and clearly have transmitted some of the ethics and methods of the Scratch to the younger generation. Wright cites a direct oral tradition from form members citing Tilbury, Prévost, Rowe and Jackman in specific. Lexar who took piano lessons from Tilbury said that Scratch stuff would occasionally crop up but that it was a lengthy process the transmission of the approach. Cardew’s notion that music is a dimension of perfectly ordinary reality was stressed by Wright and Lexar. Wright states that walking through London to the studio is no different then the performing that they’d be doing later on. Parsons described how a number of the Scratch composers, including himself, Skempton, Hobbs etc went on to the LMC where their influence passed on to some degree. Then in the 90s he wrote a number of open pieces for Apartment House who are a group that certainly worked in the spirit of the experimental music of the 60s. He played several of his piece’s as interpreted by Apartment House, first Rythmic Canons which he wrote in 1998 for Apartment House followed by Sustained Sounds with Percussion. The first piece has a dynamic rhythmic feel rather like Steve Reich’s Music for 18 Musicians and the second more or less sounded as the title indicated with a fairly spare feel. Later Parsons played a third piece of his performed by Apartment House that was of an indeterminate nature called Glissandi and Woodblocks. There was a lot more in this segment, really one of the most interesting dealing with the ongoing legacy of the Scratch. The importance of Eddie Prévosts workshop was stressed and there was a bit of discussion on how those ran. The role of listening and responsibility of the player to work with the others was stressed. Also the moral element of the workshops. Lely: “Its a very serious occupation…Its partly to do with restraint and allowing other people to have space around them”. At one point Wright asks Parsons about the ideas behind the genesis of the Scratch Parsons cites Cages Black Mountain College happening with Cunningham, Rauschenberg, Tudor et al. The influence of Cage is cited over and over again among the 36 hours, from a live concert in London of the Cunningham Dance company with the Rauschenberg sets and Cage and Tudor performing that many of the members say, to Cardew’s closeness to the New York School and so on. He traces the notions even further back to Man Ray and Duchamp, once again connecting the visual arts to experimental music. Wright tries to insist on some sort of British experimental tradition but they had nothing to back this up. After this there was some interesting discussion on notation and Wright pointed out how useful the material in the Scratch Book has been for him, filled with ideas and notations that he can put to use. Quite a bit of music was played throughout this block, new recordings from this younger generation. An excerpt from Wright and Lexars excellent duo blasen, and several pieces from John Lely’s including aduo with Scratch stalwart John White, amusing entitled LelyWhite and his Parsons Code for Melodic Contours. The final piece in this block was an extract from Lely’s Mechanical Rite which was a kind of an sample based take on the Scratch’s improvisational rites. There was a lot in this two hour block and I really only touched on it in this overly lengthy writeup but the primary notion is that the influences from the Scratch are legion amongst the current crop of British Improvisers and clearly the transmission continues. i found a lot in this segment highly interesting as of course I am quite involved in current trends in improvisation and it was really current improv that lead me back to Cardew and the Scratch in the first place. While there were completely set programs for every hour of the 36 things got progressively looser and some things ended up not happening. This block of programs covering four hours all kind of merged together. There was more chat with Michael Parsons followed by a live performance of his Independent Pulses. There was a bit from the Scratch jukebox after this, Howard Skempton playing a couple of pieces on the accordion. This was followed by Haydn Dickenson playing two Cardew piano pieces, Croppy Boy and Father Murphy, followed by short extract from an Eddie Prévost improvisation. Next up was another in studio performance this time Cardew’s Song of Pleasure performed live in studio. There was some filler as then transitioned into Michal Chant including Pilgrimage 1 & 2 from Pilgrimage to Scattered Points of the Body to the Brain, Inner Ear. Heart and Stomach. and Laurie Bakers Circle Piece from 1970. It evolved into Micheal Chant first talking but mostly playing One Day in the Life of John Tilbury, a 24 hour piano piece that he wrote for John TIlbury’s 60th birthday. This gets played on and off throughout this marathon broadcast. Its a nice rather minimalist type of piece with slow repeated phrases. The first performance of the piece was actually over 24 hours by multiple performers for Carole Finer’s 70th birthday. This is a nice relaxing piece, that I could definitely see having on for hours in the background. The Scratch Orchestra’s agent, Victor Schonfield, is interviewed by Ed Baxter. Schonfield set up concerts as Music Now for many British musicians including AMM, Cornelius Cardew, John Tilbury, Christopher Hobbs, John White and the Scratch itself. As an agent Schonfield didn’t get rich didn’t even really make money at all. He mainly worked to get gigs for those he represented but his main interest was to put on shows he wanted to see. “It was a way to enable me to listen to as much music as possible”. He was interestingly frank about the things he didn’t like; he wasn’t a fan of The Great Learning which he felt was the exact opposite of everything the Scratch Orchestra stood for. The best performance ever in his opinion was the Schooltime Compositions performance at the ICA pre-Scratch. What he loved about the Scratch it was the “One and only John Cage Big Band (or Orchestra)”. He disliked how legalistic it was and he disliked the sub-groups that played straight music. He felt this was too choir boyish. On the politicization he was unimpressed as he had done actual political work for the Labour Party for years and felt that the Scratch’s sudden politicization was naive and ineffectual. He once lectured the members of AMM in the mid sixties about their total indifference toward politics and the world outside of music. He also describes Keith Rowe as being early and particularly politicized and stressed his closeness to Cardew. Most of the music though he felt wasn’t any help promoting the political ideas behind it. He described the political music of the Scratch as as “Fascist Sunday school hymns. Sunday school hymns talking about the musicological aspect, fascist in the sense of revealed authority, giving no scope for interpretation or ambivalence, ‘this is the message you’ve got to like it or lump it.’ ” He thought almost all of the political material was rubbish though he gave the PLA some props. He also quite liked Cardew’s piece ‘10,000 nails in the Coffin of Imperialism” which I have to say is a great score which would be great to hear live. His final analysis was that you can do better work directly in politics and that political music never really does much good and thus he moved on to directly trying to move the Labour Party to the left in the mid 70s. Schonfield’s analysis of the Scratch is actually some of the most astute in this whole program. He connects much of the activities to Cage’s notion of combing music with other activities. Up to half of the actions going on in a Scratch performance maybe no sound Schoenfeld. Activities that don’t make any sound but are timed or scored. He gives the example of Cage’s Waterwalk but with forty or fifty people doing it all at once over wide area. The surprising things that would crop up in performance were Schoenfelds most treasured moments, inserting folk music into the piece, or a short tenor sax obbligatos and short melodic phrases from Lou Gare or a small group spontaneously singing a fragment of a pop song. Stay tuned for part two of my examination of this epic broadcast. A Spiral Cage is powered by	WordPress 4.6.14 and delivered to you in 0.344 seconds using 22 queries.